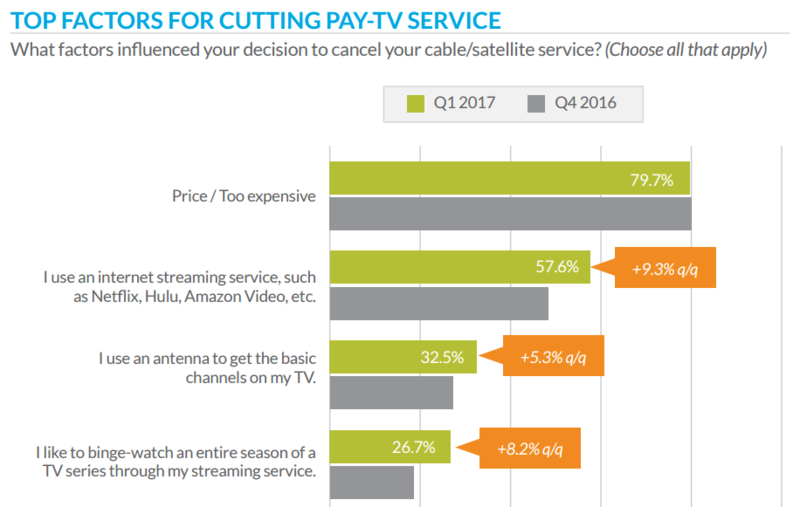 37.1% of respondents spent at least $101 per month on cable TV, with some spending upwards of $150 per month, with trends only aiming higher. While cable providers often pay ample lip service to "providing value," the entire cable and broadcast sector continues to believe that it can simply refuse to compete on price with a growing roster of streaming competitors now arriving at the gates of their beloved cash cow. "It’s a difficult thing to model. But we’re coming at it both ways, both from creating a value proposition in the pricing and packaging we have, and doing those smart things that you can do with an existing customer base that’s been mispriced to move them in the right direction." When the increase in monthly bills is coupled with the fact that 81.4% of unsatisfied respondents selected “Too expensive/increase fees for cable/satellite service,” it becomes evident that something must be done about this group. With more options than ever for TV in 2017, consumers continue to get smarter about their TV options, and many have discovered ways to access TV for far less than $100 a month. Skinny buddle offerings have increased, too, and options include Dish Networks’ SlingTV, DIRECTV NOW and Sony’s PlayStation Vue. Instead of competing on price and package flexibility, most large cable companies (like Comcast) have responded to cord cutting by not only raising TV rates, but ramping up deployment of arbitrary and unnecessary broadband usage caps and "overage fees", allowing them to counter any lost TV revenues with broadband price hikes, and punish folks looking to wander away from Comcast's own TV walled garden. But Charter is prohibited from using caps for another six years as a condition of its recent megamerger, conditions the FCC has started to slowly but surely nibble away at. Still, the cable industry has at least progressed in one meaningful metric: a few years ago it denied any of this was happening whatsoever. ... if by "move them in the right direction" he meant "towards the exit"
Well, maybe. But, between people instigating Poe's Law and numerous anonymous comments that seem suspicious similar in tone and content, it's hard to tell. He could be one of the dumber trolls who keeps coming back under different names, he could be a new one who has insisted on not creating an account until recently (though, laughably, has managed to choose a slightly different name after months of whining that "his" name is being used by other people). He could have been away for weeks without anyone noticing, he could be lying about that as he does many other things. As ever, his lack of maturity in communicating ideas and past refusal to be accountable for his posting history makes his statements nonsense.